With cooler weather my operating has moved indoors. Here in Minnesota it's a little cold for QRP in the park. Now I'm on the air using my boat anchors in the basement. Real radios keep you warm in the winter. December kicks off the winter contest season for me. This is the month for the AWA Bruce Kelley 1929 QSO Party. 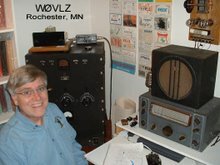 See http://www.antiquewireless.org/bruce-kelley-memorial-cw-qso-party.html . This QSO Party has a strict equipment requirement that sets it apart of most other ham radio operating events. Any transmitter used must be of 1929 (or earlier) design and use tube types available in 1929. The ARRL sponsors Straight Key Night on New Year's eve and day. See http://www.arrl.org/straight-key-night . Participants are encouraged to get on the air and simply make enjoyable, conversational CW QSOs. While not specifically oriented towards vintage gear it is certainly boat anchor friendly. The AWA Linc Cundall Memorial CW Contest occurs in early January. See http://www.antiquewireless.org/awa-linc-cundall-memorial-cw-contest.html . Here the objective is to contact the greatest number of participating stations using pre-1950 designed gear. In early March there will be the Novice Rig Roundup. This is a nine day operating event encouraging the use of vintage ham radio equipment from the early era of the Novice License. See http://novicerigroundup.com/ for the details. During the last few days of the Novice Rig Roundup, if you are looking for another contest/event in which to use that novice gear, there is the AWA John Rollins Memorial DX Contest. See http://www.antiquewireless.org/awa-john-rollins-memorial-dx-contest.html . It is open to all and runs on 40 and 20 meter CW. Pre-1960 equipment, such as 1950s novice gear, earns a multiplier and also various power levels including below 75 watts, the original "Novice gallon".